1. Bring the chicken stock to the boil and add the saffron. Turn off the heat and leave the stock to infuse while you start the rest of the dish. 2. Heat the olive oil in a large, heavy-based saucepan. When hot, add the chicken and brown all over. Remove the chicken to a plate and drain off any excess oil from the pan. Add the chorizo, onion and garlic and fry for 3 minutes, stirring regularly. 3. Stir in the chopped tomatoes and fry for 2 minutes, by which time they should start breaking down. Add the rice and stir through to mix. Return the chicken to the pan and pour over the infused stock. Scatter the green beans over the top and season generously. and cook for a further 5 minutes. Turn off the heat and leave the dish to sit for 5 minutes. 5. 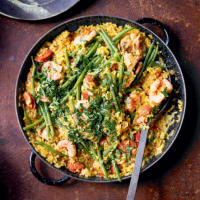 Serve up the paella sprinkled with chopped parsley and a wedge of lemon to squeeze over.